Friday, October 2, 2015 . When Summerhill and Bishop asked me to come teach their first ever Masterclass at their new school in London last week, I was honored and thrilled. Summerill and Bishop is located in the most gorgeous neighborhood at 100 Portland Road near Notting Hill. If you’re in London, make a point of stopping by and if time allows, take a class. However, once I met the amazing staff at S&B School, I knew everything would be in place and ready to roll by Thursday night at 6:30pm…and I was right. Eliza and Marcelo made sure everything would be in place; what an amazing team! After an early morning trip to the New Covent Garden Flower Market for my floral craft project, we were ready to go. Btw, the wholesale flower market was a highlight and not unlike any other flower wholesaler. It was filled with beauty and very funny snarky vendors, but here in London they have adorable English accents. Summerhill and Bishop, quite honestly, has one of the most comprehensive selections of handmade linens I have ever seen, and every other chic thing you would need for your table. And yes, as you can only imagine, I went nuts. Let’s say that there will be some very very pretty props for my next workshop in Italy. The selection of tabletop is beautiful, chic, and approachable. Fair to say if I lived in London, it would be my go-to prop shop. The good news is I can order online and ship everything. Don’t you just love that? Thursday night, the school was filled with nibbles, wine, lovely ladies, and lots of lively banter about setting your table for the upcoming holidays. I talked about how to be prepared, basics of organization, how to produce your party like a pro, and how to create a beautiful flower arrangement in an unlikely vessel, like a juice glass. With our juice glasses in hand, we crafted a votive and vase project using seed paper and raffia. We filled the vase with a beautiful floral arrangement, and even made a place card and take home gift for guests. These are just a few clever solutions for the table using a simple juice glass. You all know that’s the way I like to do it! Punch holes with a hole puncher in a belly band of seed paper that is wrapped around the juice glass tied with raffia. This craft project is the perfect votive holder and vase to parade down the middle of your holiday table. Easy to make and so impressive. Everyone was so enthusiastic about making a floral arrangement, plus they got to take it home at the end of class. We finished up the class by making my no bake dessert: a Raspberry Cannoli in a glass using the same small juice glass we made our votive vase project with. Unlikely vessels with brilliant results. My basic juice glass project 3 ways was a big hit. As you know, in my cookbook Picture Perfect Parties, I have tons of easy and brilliant craft ideas plus delicious recipes to make all your parties unique and special with that personal touch. The school is run by the charismatic chef, Marcelo de Campos. Marcelo is West London’s best kept secret, and the man behind some of the most exclusive dinner parties and events in town, and he’s bringing his know-how exclusively to us here at School. Having worked in some of the best kitchens in the world—from Gordon Ramsay’s, to Claus Meyer’s (of Noma fame), to the hallowed halls of Claridges, to some of the most exclusive private London residences—he’s not only a chef, but a trained expert in l’art de recevoir. And, with his Brazilian roots, he brings a sense of fun and warmth to everything he touches. Please contact school@summerillandbishop.com or call +44 (0) 20 0001 3415 for more information on classes. Friday, November 16, 2012 . Thanksgiving is right around the corner! Let me just say that I am so thankful for all of YOU. Thank you for all of your love and support this year. It means a lot! As far as Thanksgiving goes, I like to create a menu, prepare for days in advance and then enjoy the day once it is here. One of my favorite resources is Hayneedle.com. 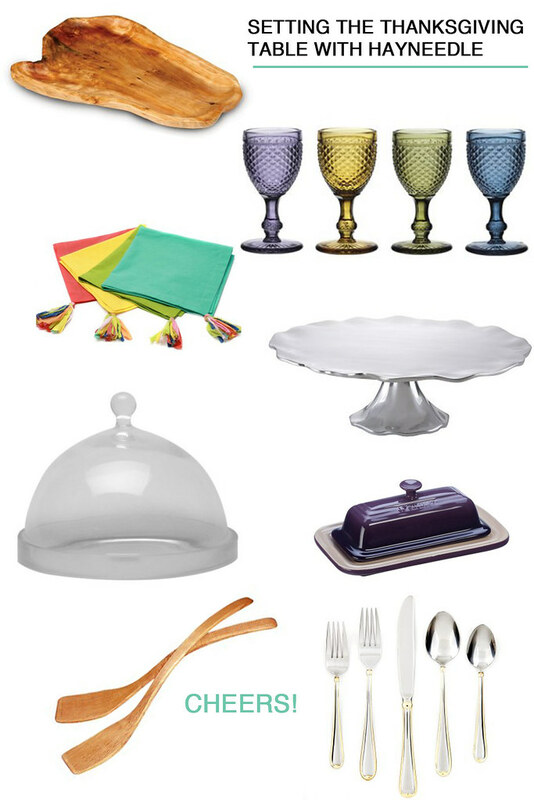 I can always find a great deal on some really great glass + serve ware, home decor, accessories, you name it! I thought it would be fun to put together a Thanksgiving table with lots of color, natural elements and great ways to present those beautiful pies and cheese plates!